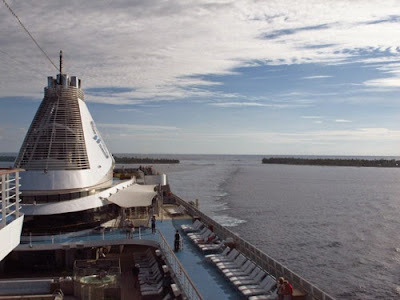 When people think of taking a cruise to South Pacific islands, the first place that comes to mind is oftenTahiti, with Bora Bora a distant second. These are gorgeous islands with sandy beaches, soaring mountains, and lush vegetation just like in photos you’ve seen from the French Polynesian islands. But there’s more to explore in the South Pacific, especially if you like to snorkel or scuba dive. 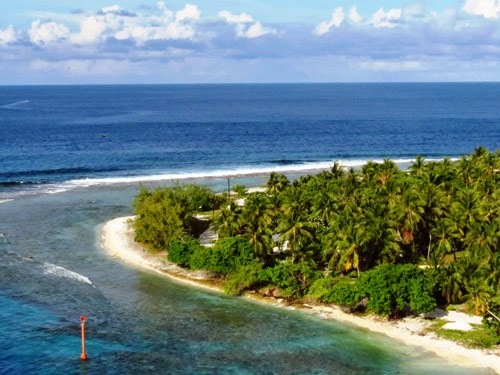 Although many of the 78 atolls (narrow strips of land surrounded by reefs) scattered throughout the Tuamotu Archipelago are not easy to get to, there's a small airport at Rangiroa, if you’re traveling on your own, and cruise ships are now including several atolls as ports of call. Pacific Ocean on the other side of this narrow strip of land. 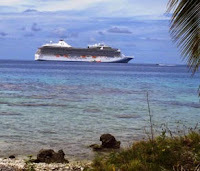 Tuamotu Archipelago is the world’s largest group of coral atolls, but only 31 have passes (breaks in the reef) through which ships may enter, which means the Tuamotus are quite isolated. 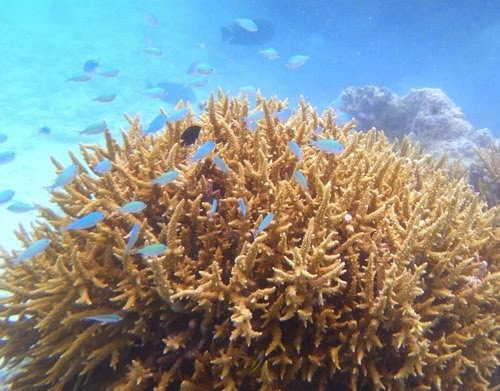 But accessible reefs also mean snorkeling is excellent at islands like Fakarava and Rangiroa. Luminous turquoise water teems with plentiful marine life including many fish varieties and various rays and sharks. It’s a true natural aquarium with some of the best swimming, snorkeling, and diving in the South Pacific. snorkeling from the shore of Fakarava. Fakarava has two ocean passes (and the largest one in the Tuamotus), which make it passable for ocean vessels and an outstanding diving and snorkeling location. You can snorkel from the beach, but since there is little sand you’ll likely enter the water right over coral. A protected lagoon is on one side of the atoll with the deep Pacific Ocean on the other side. Pearl farming is an important industry for Fakarava and Rangiroa..
More a strip of land than an island, Fakarava is a prime example of nature at its finest—the environment is so unspoiled it has been designated a UNESCO Biosphere Reserve for the preservation of rare plant species. Walk down the main street and you’ll see beautiful gardens full of colorful hibiscus, bougainvilla, and other tropical blooming flowers. 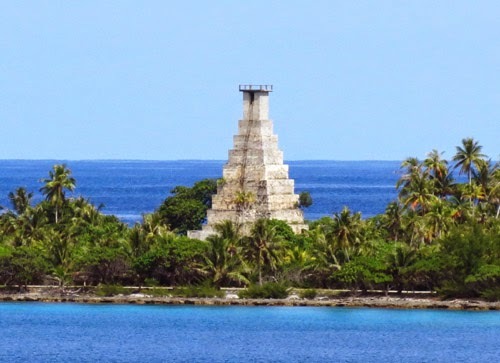 Rangiroa is the Tuamotu’s most populous atoll and one of the world’s best dive spots. Our ship entered through the Tiputa pass on the northern side of a very visible coral ring around the atoll. Resembling a string of pearls, the coral encircles a clear turquoise lagoon. 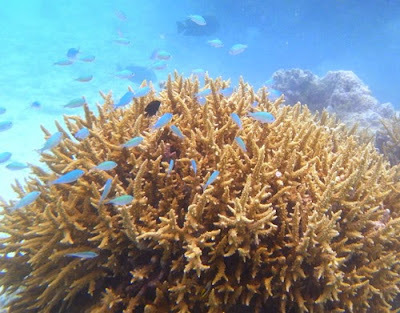 The exchange of water between open sea and lagoon creates a fertile habitat for marine life, so it provided some of our best snorkeling on the trip. 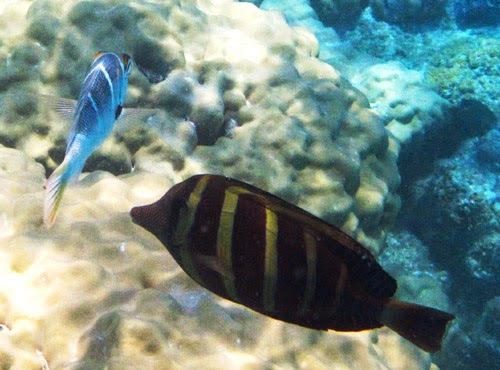 Fish are plentiful in the clear turquoise water off Rangiroa. 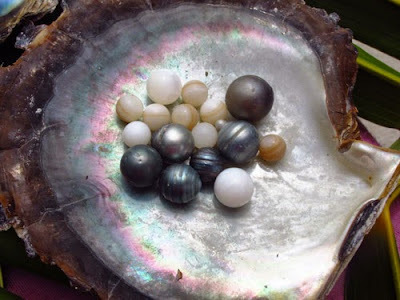 After soaking up the palm tree-studded landscape at Rangiroa, visit Gaugin's Pearl Farm to learn how pearls are produced, how various colors are obtained, and what to look for if you want to purchase a worthy pearl. Prices are relatively inexpensive here compared to more popular Polynesian locations like Tahiti, and you may find that pearls rated a bit lower are just as lovely as the more pricey ones. Another look at the reef surrounding the atoll.